Alexander et al. 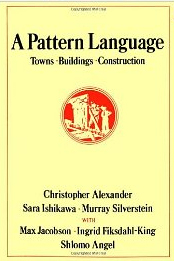 (1977) Pattern Language: Towns, Buildings, Construction. Oxford University Press, New York, pp.1171. Pattern Language is a way in which to approach architectural design and town planning to maximise the enjoyment and use of the space for people. It is about ensuring that design is for people rather than just to look good. The ‘language’ creates a detailed understanding of how each house (and town) should be to maximise comfort, utility and enjoyment. Despite being three decades old it contains a huge number of rules for design which we appear to be ignoring to our detriment. For example, on the matter of home ownership it suggests that “people cannot be genuinely comfortable and healthy in a house which is not theirs” (p.393). However, this does not mean everyone should own a home, instead “keep the emphasis in the definition of ownership on control, not on financial ownership. Indeed, where it is possible to construct forms of ownership which give people control over their houses and gardens, but make financial speculation impossible, choose these forms above all others” (p.394). Other rules include 159. Light on two sides of every room, and 197. Thick walls. It also advocates modest dwellings, where a house for one person would be single room with a number of alcoves and “the entire house may be no more than 300 to 400 square feet” (p.391).